At the invitation of Kuwaiti First Deputy Prime Minister and Foreign Minister Sabah Al-Khalid Al-Hamad Al-Sabah, Saudi Arabian Crown Prince Mohammad bin Salman, Sudanese First Vice President and Prime Minister Bakri Hassan Saleh and the Namibian government, Vice Premier Zhang Gaoli will pay visits to Kuwait, Saudi Arabia, Sudan and Namibia from August 21 to 29, and chair the second meeting of the high-level inter-govermental joint committee between China and Saudi Arabia. Q: According to media reports, the ROK President Moon Jae-in said today that no one could launch a military operation on the Korean Peninsula without the approval of the ROK and once again urged the DPRK to come back to dialogue. What's your comment on that? A: I have seen the relevant reports and noted that they said President Moon Jae-in claimed the ROK government would spare no effort to prevent a war. According to media reports yesterday, President Moon Jae-in also said there must not be another war on the Korean Peninsula, and the Korean Peninsula nuclear issue should be resolved peacefully. China has always maintained that to properly resolve the Korean Peninsula nuclear issue through peaceful means and uphold peace and stability on the Korean Peninsula conforms to the common interests of various parties, which is worth and also calls for the concerted efforts of various parties. At present, the situation on the Korean Peninsula is highly complex and sensitive,nearing either the critical point of crisis or the turning point with a crying need for a decision to return to peace talks. Various parties should exercise restraint, seize the opportunity, show decisiveness, make right choices that are responsible to their people and regional peace and take correct actions that are conducive to easing the tensions and peacefully resolving the Korean Peninsula nuclear issue. Also, I want to point out that the improvement of inter-Korean relations through dialogue and promotion of reconciliation and cooperation serve the fundamental interests of the two sides. We hope the DPRK and the ROK can make positive efforts to move towards this direction and create conditions to break the deadlock and resume the talks. Q: According to media reports, the DPRK said that it was not going to attack Guam just yet and it was holding off on any attack plans in what seems like a lessening of tensions. What is China's response to this? How do you think the US should respond to the DPRK's seemingly deescalating moves? A: As I said just now, to peacefully resolve the Korean Peninsula nuclear issue and uphold peace and stability on the Korean Peninsula conforms to the common interests of various parties, which is worth and also calls for the the concerted efforts of various parties. At present, the situation on the Korean Peninsula is indeed highly complex. We hope all relevant parties can be cautious with their words and deeds and do more things that are conducive to easing tensions and enhancing mutual trust. As President Xi Jinping stressed in his telephone conversation with President Donald Trump, the final solution of the Korean Peninsula nuclear issue comes down to the commitment to the general direction of dialogue, negotiation and political settlement. At present, we hope the words and deeds of various parties shall put out the fire rather than pour fuel on the current tense situation and help various parties to take an important step forward towards the common goal of enhancing mutual trust, upholding peace and stability on the Korean Peninsula and peacefully resolving the Korean Peninsula nuclear issue. Q: In a jointly signed article on the Wall Street Journal, the US Secretary of State Rex Tillerson and Secretary of Defense Jim Mattis said that, diplomacy is their preferred means of changing the DPRK's course of action. The object of their peaceful pressure campaign is the denuclearization of the Korean Peninsula. The U.S. has no interest in regime change or accelerated reunification of Korea. They do not seek an excuse to garrison U.S. troops north of the Demilitarized Zone and have no desire to inflict harm on the long-suffering DPRK'S people. At the same time, the article also said China is involved with 90% of the DPRK's trade. It must make the decision to exercise its decisive diplomatic and economic leverage over the DPRK. What's your comment on that? We have noted the relevant report and Secretary of State Rex Tillerson and Secretary of Defense Jim Mattis's positive remarks on commitment to diplomatic settlement of the Korean Peninsula issue. We hope the US side can translate the relevant positive remarks into its DPRK-related policy, and also call upon the DPRK to respond to the positive signal sent by the US. China's position on the Korean Peninsula nuclear issue remains consistent and clear-cut. We have always stayed committed to denuclearization of the Korean Peninsula, upholding peace and stability on the Korean Peninsula and solving the issue through dialogue and negotiation,for which we have made enormous efforts for a long time. We have always maintained that security issue is the core of the Korean Peninsula issue, and the DPRK and the US hold the key to the solution. We hope that the relevant parties can take seriously the Chinese-initiated "suspension for suspension" proposal, accommodate each other's reasonable security concerns and find a breakthrough for peaceful solution of the Korean Peninsula nuclear issue through talks. China will continue to implement the relevant UN Security Council resolutions comprehensively and faithfully, and as usual play a positive and constructive role in promoting the peaceful settlement of the Korean Peninsula nuclear issue through diplomatic means. We also hope other relevant parties can join our efforts for the shared goal. Q: It marks the memorial day of the end of World War II for Japan today. By far there has been no tributes to the Yasukuni Shrine by any member of Shinzo Abe's cabinet, which is unprecedented since he came into power in 2012. What's your comment on that? A: We have noted that by far Prime Minister Shinzo Abe has not paid tribute to the Yasukuni Shrine but offered sacrifices to it. China's position is very clear. The Yasukuni Shrine honors Class A criminals of the Second World War who are directly responsible for the war of aggression, and we are firmly opposed to any wrongdoing of the Japanese side. This year marks the 72th anniversary of Japan's unconditional surrender and the 80th anniversary of the Lugou Bridge Incident and the Nanjing massacre. The Chinese side urges the Japanese side to face up to and reflect upon the history of aggression, make a clean break with militarism and win the trust of its Asian neighbors and the international community with concrete actions. Q: The US President Donald Trump yesterday signed a Presidential Memorandum to direct the United States Trade Representative (USTR) to examine whether China should be investigated for trade matters. China's Ministry of Commerce has issued a statement today in response. Will this affect China and the US' cooperation and efforts to solve the Korean Peninsula issue? What's your comment on that? A: You just mentioned the Spokesperson of China's Ministry of Commerce has issued an address and expressed serious concerns on the US President's signing of the relevant memorandum. 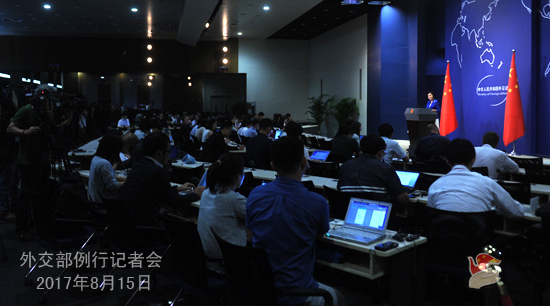 There are three important points in his address: first, we think the US should not be a spoiler of multilateral rules; second, any protectionist action by the US side will surely undermine the bilateral economic and trade relations as well as the interests of both Chinese and American enterprises; third, if the US take measures that are harmful to bilateral economic and trade relations in disregard of facts and with no respect to multilateral rules, the Chinese side will never sit idly and will take every appropriate measure to resolutely uphold its lawful rights and interests. As to the Korean Peninsula issue, we have said many times that China's position on the Korean Peninsula issue has been clear and consistent. We will proceed from safeguarding international non-proliferation regime, peace and stability on the Peninsula and China's security interests, uphold objectiveness and fairness, and play a positive and constructive role in promoting the peaceful solution of the Korean Peninsula issue through diplomatic means. Follow-up: Will the US' decision affect its cooperation with China on the Korean Peninsula issue? Will it affect China's efforts for the settlement of the Korean Peninsula issue? 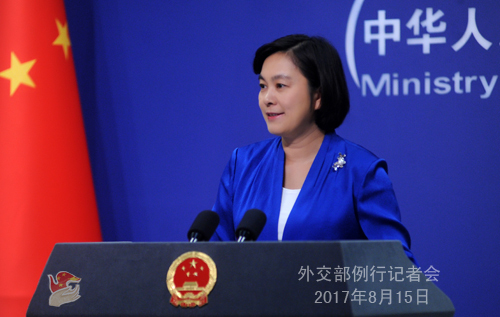 A: I have already made the relevant remarks and reaffirmed China's long-held stance on the Korean Peninsula issue. 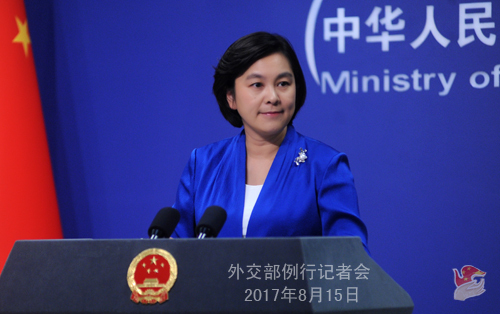 China is willing to stay maintain communication with the US on the basis of mutual respect. Q: On August 13, the Japanese TV station NHK broadcast a special program titled The Truth of Unit 731 on the eve of the 72th anniversary of Japan's defeat in the War of Aggression against China. It unearths a more-than-20-hour recording of confession by Japan's Unit 731 and fully restores the heinous crimes committed by this unit in Japan's War of Aggression against China. How do you comment on that? A: During World War II, the invading Japanese troops waged a heinous bacterial war against the Chinese people, conducted cruel and inhuman living-body experiments and committed monstrous crimes. The relevant evidence is ironclad and undeniable. Only by correctly recognizing that period of history can Japan unload the historical burden. We appreciate the courage of those insightful Japanese people to reveal the historical truth and hope the Japanese side can carefully listen to the call for justice at home and abroad, correctly understand and deeply reflect upon the history of aggression by the Japanese militarism, and earnestly respect the feelings of the Chinese people and people of other victimized Asian countries. Q: It is reported that at least over 300 people were killed in a flood and mudslide following heavy rains in Sierra Leone's capital Freetown on August 14. Is there any Chinese national injured? A: We have noted that the flood and mudslide in Sierra Leone have caused massive casualties and property losses, and expressed our sympathy and condolences. After the disaster happened, the Chinese Embassy in Sierra Leone tried to gather and verify information immediately, and there is no report of casualty of Chinese nationals by far. The Chinese embassy has warned the Chinese nationals and enterprises in Sierra Leone to raise security awareness and enhance preparedness, and will further follow the development of the disaster and the situation of the Chinese enterprises and nationals. China has also been hit by the earthquake in Jiuzhaigou and other natural disasters, and we share sympathy with what happened in Sierra Leone. Following the disaster, some local Chinese enterprises immediately joined in the relief efforts at the request of Sierra Leone and provided rescue equipment. This fully demonstrates the friendship between China and Sierra Leone and their peoples. If needed, China will give positive consideration to providing further support and assistance to Sierra Leone. We also hope and believe that under the leadership of the government of Sierra Leone, its people will surely overcome the disaster and rebuild their homeland as soon as possible.